Ma Phi Leng Pass (also known as Ma Leng) is known as one of the “four great mountain passes” of the mountainous north of Vietnam along with O Quy Ho Pass, Pha Din and Khau Pha. Situated at an altitude of nearly 2000m, this is the only bridge between the two towns of Dong Van and Meo Vac in Ha Giang province. 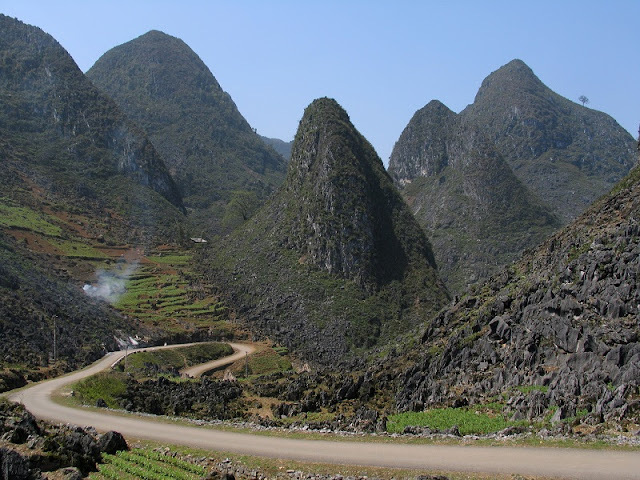 Situated on the Happiness Road connecting Dong Van and Meo Vac, Ma Pi Leng is the name of the most dangerous road in Vietnam, in the province of Ha Giang, which means “horse nose”. This is one of the “four great mountain passes” well-known by many travellers and backpackers. This road is about 20 km long, curving around the mountain peak 2,000 m. Ma Leng is also known as “the king of rugged roads” in Vietnam. This place attracts not only the visitors but also the photographers by the beautiful scenery. It is referred to as the "king" of Vietnam passes. Ma Pi Leng pass with one side is the deep chasms, another side is the erect cliff, which has been a big challenge to those who preferred adventure. After crossing the slopes, visitors set foot on the top of Ma Pi Leng, will suddenly surprise the majestic mountains appear in the sky. Ha Giang’s four seasons are beautiful and poetic. So, you can pass the Ma Pi Leng at any time of the year. However, from June to August is summer which is always sunny in Ha Giang; therefore, it is a good time to have beautiful pictures of the plateau. But over the summer, the road is quite slippery. In the morning and evening, there is often thick fog. You should be careful and go in the safest time. Coming to Ha Giang explore the majestic scene and take me to some interesting experiences this place.